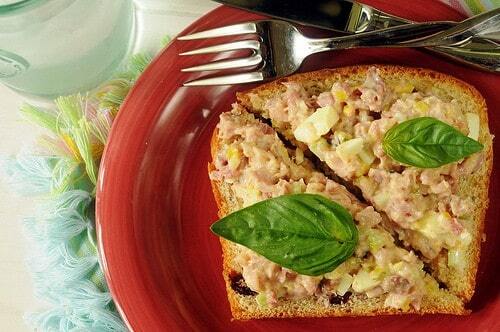 Ham salad is a quick way to repurpose leftover ham. 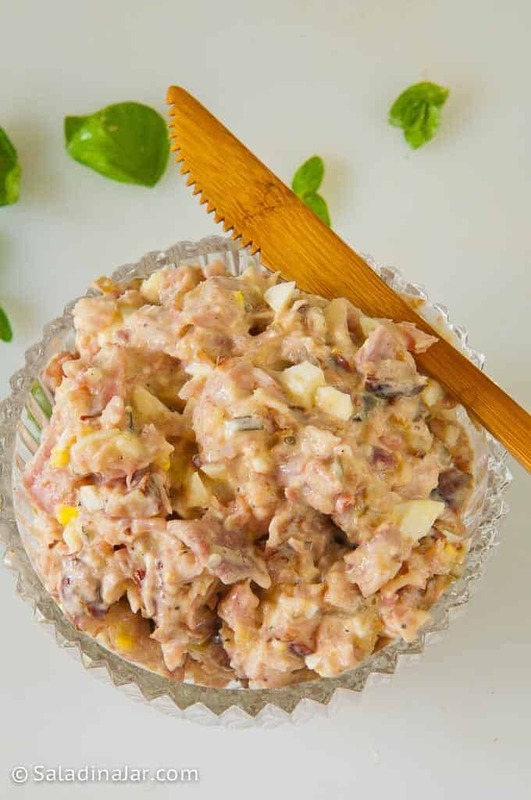 A bit of mayonnaise, hard-boiled eggs, sweet pickle relish, and some seasonings, and you’ll be in “hog heaven.” Use ham salad to make a satisfying sandwich, a light supper or appetizer with oven-baked sweet potato chips, or as a dressing-substitute for your daily salad. 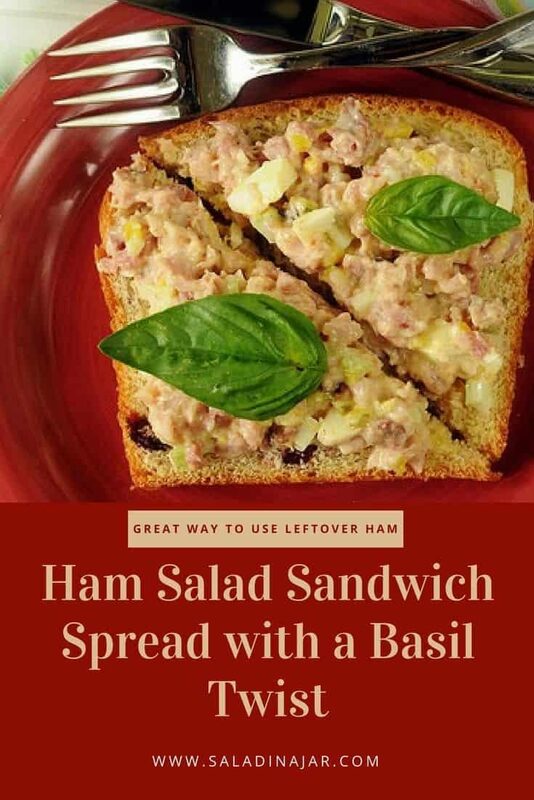 Ham salad and bologna will always be connected in my mind. My mom used to bring home long, fat sticks of bologna. I’m guessing it was cheaper than the sliced variety. She would attach an old-fashioned silver grinder to a stool in the kitchen. Next, Mom would cut the bologna up in big chunks. Then we (my sister and I) pushed it through the grinder while turning the big silver handle. Watching ground up bologna extruding out of the holes was a magical process in a kid’s eyes. I remember adding hard-boiled eggs, pickles, and mayonnaise together. Mom called it “ham salad.” What???? Today, I will not eat bologna. It’s probably not that bad if you fry it with the little slits, but I won’t go there, either. How do you eat ham salad? Is it always in a sandwich, or do you eat it with a spoon right out of the bowl? I have ideas. Use as a sandwich filling. Nothing is better than white bread with ham salad spread between the layers. Try it with homemade cranberry yeast bread, cranberry lemon dinner rolls, poppy seed rolls, or these dinner rolls using the Tangzhong method. Take this recipe over the top by adding a leaf or two of fresh sweet basil to each sandwich. Your guests will be asking for your secret recipe. It is AMAZINGLY good. 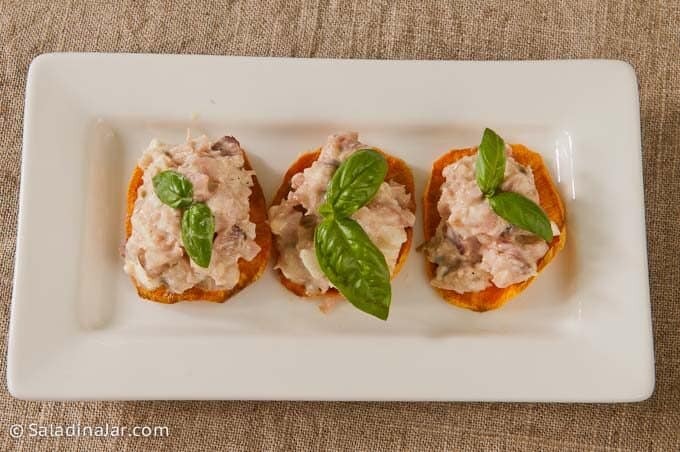 Use as a dip or make an appetizer or light supper with oven-baked sweet potato chips. 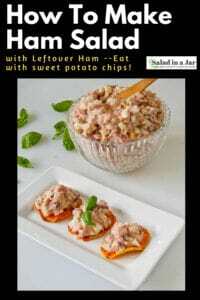 Over a year ago, I discovered how fabulous ham salad tastes with crispy sweet potato chips. My husband has always favored eating his ham salad on crackers. However, I was trying to cut out grains back then, so I started looking for a substitute when I thought of my Skinny Sweet Potato Chips. Consequently, those of you who eat grain-free or gluten-free may want to try this. Let me warn you though. The combination is addictive! Serve over a bowl of lettuce. Ham salad is not a precise recipe. Play with it. If you don’t have one or two ingredients, save yourself a trip to the store and substitute. Substitutes could include Miracle Whip (it will taste different), Greek yogurt, or Sandwich Spread. Have you tried the new mayonnaise mixed with catsup? Delicious in this recipe! For the mustard lovers among us, a teaspoon of your favorite mustard might be a welcome addition. The eggs can be left out entirely. Or, egg lovers might want to add three or even four hard-boiled eggs to their ham salad. Leftover deviled eggs in the fridge? Chop them up and add them to your ham mixture. Substitute dill pickle relish if you aren’t into sweetness. No pickle relish in the house? Try chopping bread and butter pickles finely to get a close flavor copy of the relish. Use white vinegar or lemon juice instead. Add one teaspoon and taste. Add another teaspoon if you think your ham salad still needs a little zip. I debated whether to add this one. But actually, I use this very same recipe to make an everyday chicken salad. Substitute shredded or cubed chicken for the ham. Tuna works, too. As noted before, my mom subbed bologna for ham. Or, don’t use any meat and throw in a couple of extra eggs to make a simple egg salad. 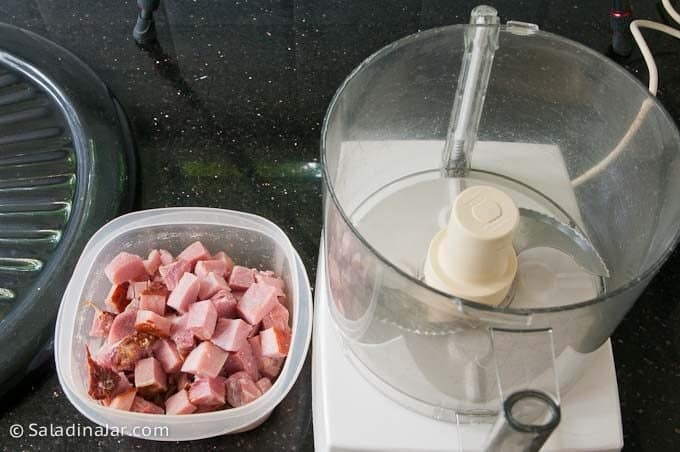 After cubing leftover ham, place it in a food processor and pulse for 10-15 times until ham is shredded. Add two teaspoons apple cider vinegar to balance the sweet and salty flavors. 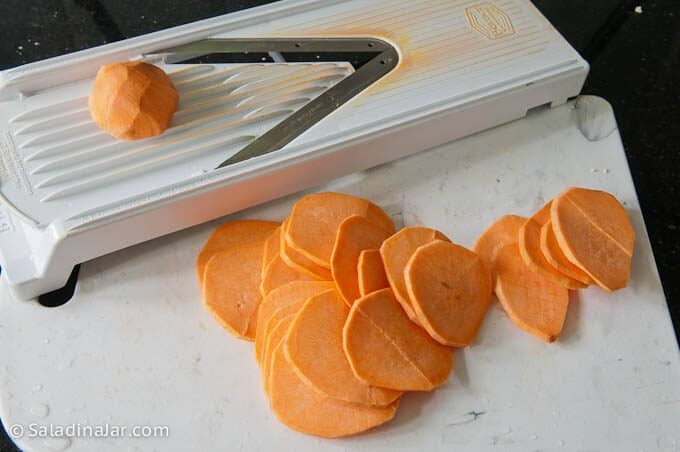 If you want to make sweet potato chips, use a mandolin to slice 1/16 inch thick. 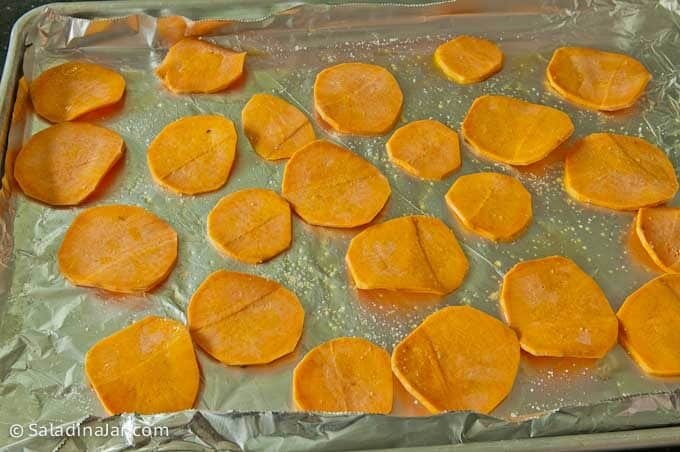 Coat lightly with olive oil and arrange on a foil covered cookie sheet as seen below. Don’t overlap pieces. Bake the potatoes in a preheated 400 degree F oven for 10 minutes. Flip the slices and continue to cook another 5-10 minutes until toasty brown on the edges. Keep your eye on the potatoes as they can overbake and turn black in a hurry. Times will vary according to the thickness and size of your potato slices. 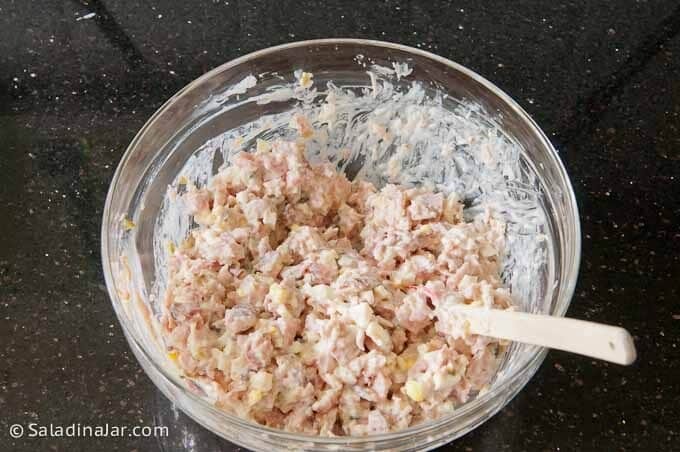 Make ham salad with leftover ham, hard-boiled eggs, pickle relish, and mayo. 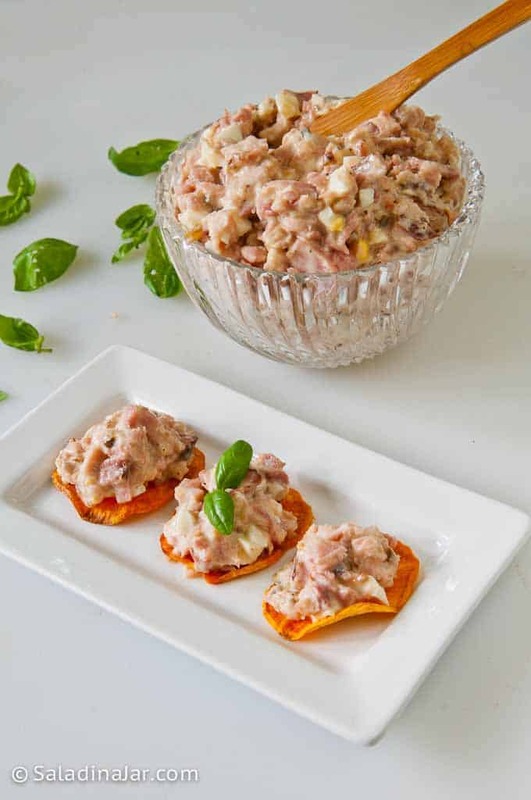 Basil make this recipe especially memorable. Serve on rolls, in sandwiches, or my favorite, oven-baked sweet potato chips. This recipe is easily cut in half if you don't have a pound of ham. 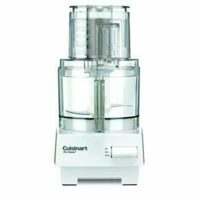 Cube ham (remove the rind if desired) then place in a food processor and pulse approximately 10-15 times until ham is chopped but not too fine. 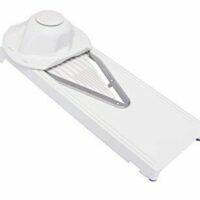 Alternatively, use a meat grinder or chop as finely as you can with a knife. 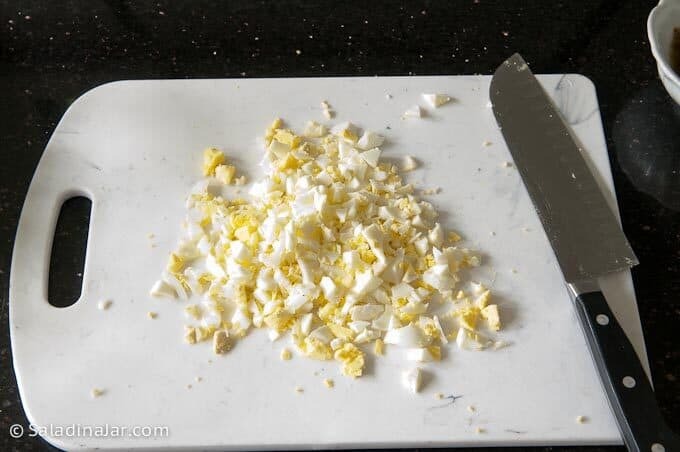 Chop hard-boiled eggs and celery, if using. Add to ham. Add remaining ingredients except vinegar and stir gently to combine. Mix in 1 teaspoon of vinegar and taste. 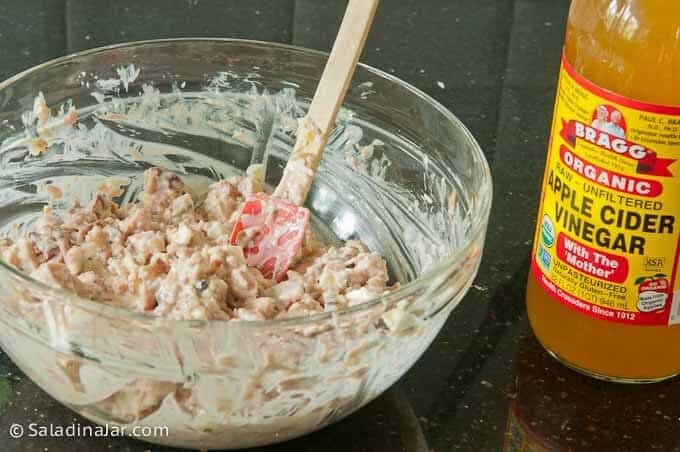 If ham salad needs a little more zip, add an additional teaspoon. Chop basil and add to spread if serving immediately. Otherwise, leaves should be left whole and added to sandwich before serving. Cut leaves will turn an unappetizing color. Post originally published in 2010; republished with new photos and copy April 2019. Can’t wait to try this! I make my ham salad with left over ham, mayo, green onion and green bell pepper, so yummy!!!! Your version sounds more colorful and equally delicious! Thanks for sharing! So your mom made it with bologna, too? Maybe everybody did it like that back then. Thanks for writing. This looks delicious! Your website is beautiful too – lovely photos, great recipes. I have found several others I’d like to try as well. 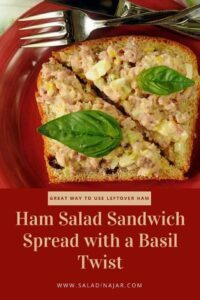 Do you mind if we share your ham salad sandwich spread recipe on our site? We always provide a link back. Very similar to the recipe I use, but I like the addition of the basil. I use my Silver Bullet to chop up everything. Gives me little pieces.